1) Make the crema: Bring a small saucepan of salted water to a boil over medium-high heat. Prepare a small bowl of ice water and have it ready nearby, and a strainer, too. Blanch the parsley and the green parts of the green onions, reserving the white parts for later, in the boiling water for just a few seconds, or until bright green. Strain the water and transfer the onions and parsley to the ice bath. Take the zest and juice of one lemon and place in a blender or food processor. Drain the green onions and parsley and add them to the blender, along with the crème fraîche. Purée until smooth, then salt and pepper to taste. 2) Make the potatoes: Place the potatoes in a medium saucepan and cover just barely with water. Season the water generously with salt and bring to a simmer over medium heat. After the water evaporates, add three-quarters of the stick of butter to the pan and continue to cook until the potatoes are just tender, about 20 minutes. Using a slotted spoon, transfer the potatoes to a sheet pan to cool. 3) In the meantime, cook the bacon in a skillet over medium-low heat until the fat has rendered but the bacon is just shy of crispy. Remove the bacon to a paper towel but reserve the fat in the skillet. When the potatoes have cooled, gently smash them with your palm, just enough to break the skin. Reheat the bacon fat over medium heat with the remaining quarter stick of butter. Add the potatoes and brown them on both sides, about 5 minutes per side. When the potatoes are almost browned, add the reserved white parts of the green onions along with the bacon, stir gently to combine, and remove from the heat. Season with black pepper and cover to keep warm. 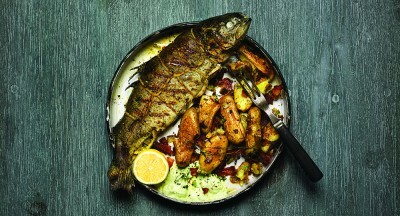 4) Make the trout: On a clean work surface, open trout up with skin side down. Generously season the inside with salt and pepper. Slice two of the remaining lemons and shingle the slices inside the trout, using half a lemon per fish. Place two sprigs of thyme atop the lemon slices, then fold up the trout and tie each of them with butcher’s twine to keep the lemon inside. Brush the skin with olive oil. Grill the trout over medium heat, about 3 to 4 minutes per side, or until the flesh is firm to the touch.